Many couples ask me the same question: How can we get back on track after a disagreement? Conflict is an inevitable part of an intimate relationship. Couples who discuss concerns in a timely and respectful way, embrace compromise, adopt a resilient mindset, and commit to repairing hurt feelings will bounce back from disagreements faster and build a successful long-lasting partnership. A “recovery conversation” is a way of talking about a fight after both people have calmed down, are less defensive, and can appreciate his or her partner’s point of view. A recovery conversation will help you get back on track after an argument and prevent issues from festering. Many couples tend to point fingers at one another rather than listening, stating what they need in a positive way, and giving each other the benefit of the doubt. A typical example is Monica and Derrick, both in their mid-forties, raising young two children and married for ten years. Unfortunately, the common thread in this couple’s comments is focusing on each other’s flaws rather than ways to repair their relationship. In Marriage Rules, psychologist Dr. Harriet Learner explains that one of the factors that lead to failure of a marriage is waiting for the other person to change. 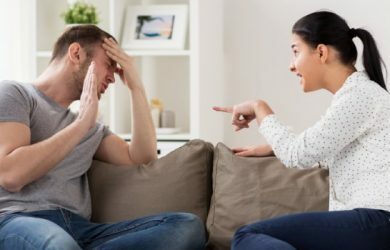 She advises that rather than giving up on their relationship, couples need to lean towards each other, increase their positive emotional connection, and learn good repair skills after a disagreement. Instead, let your partner know what you need in a positive way. For example, saying something such as “I’d really like to plan an activity for us” is more effective than “You never make time for me.” Dr. John Gottman reminds us that criticism is damaging to a marriage and that talking about specific issues will reap better results. It is important to not try to prove a point, instead, try to examine your part in a disagreement. Ask yourself whether it is more important to “win” an argument or solve a problem. Listen to your partner’s requests and ask for clarification on issues that are unclear. Discuss expectations to avoid misunderstandings. Take a risk and deal with hurt feelings, especially if it is an important issue rather than stonewalling or shutting down. If you feel overwhelmed or flooded take a short break. This will give you time to calm down and collect your thoughts so you can have a more meaningful dialogue with your partner. Body language such as eye contact, posture, and gestures, to demonstrate your intention to listen and compromise. Unplug from technology for at least one hour each night this will help you connect with your partner and be more attentive to each other. It takes two to tango and you’ll be better off when you stop keeping score and focus on repairing disputes. Try your best not to show contempt for your partner (rolling your eyes, ridicule, name-calling, sarcasm, etc.). When Dr. John Gottman observed thousands of couples in his Love Lab doing typical daily interactions, he found that criticism and contempt were two leading causes of divorce when he followed up with them over many years. Instead of pinpointing on your partner’s flaws and try spending your energy fostering a deeper connection. When you have both “cooled off” listen to your partner’s side of the story. Do not make threats or issue ultimatums. Avoid saying things you will regret later. Be assertive yet open in your attempts to negotiate for what you want from your partner. Both individuals in a relationship deserve to get some (not all) of their needs met. Couples who have successful long-term relationships make it a priority to spend time together doing enjoyable activities on a daily basis to enhance their emotional connection. For instance, trying having a 20-minute chat with a beverage before dinner or going for a walk around your neighborhood. Couples who adopt a mindset of “We’re in this together” are able to recover from disagreements more quickly because they focus on nourishing a positive bond and repair skills. Terry Gaspard MSW, LICSW has been a therapist and relationship expert for over 30 years. Her work focuses on helping individuals, couples, and families become more resilient, build stronger relationships and marriages, and recover after break-up and divorce. She is a contributor to nine websites including The Gottman Institute Relationship Blog and the author of the award-winning book Daughters of Divorce: Overcome the Legacy of Your Parents’ Breakup and Enjoy a Happy Long-lasting Relationship. Her second book The Remarriage Manual: How to Make Everything Work Better the Second Time Around will be published by Sounds True in the spring of 2020.